Free Healthcheck for your website! After a while it can be time for your site to get an updated look. Maybe you've not been performing very well on search engines, or your website doesn't look right in certain browsers? The team here are Only too happy to take a look at the site for you! At no cost to yourself, we will look through your site at target problem areas that you specify. Once we've had a look through we'll send over our notes on your site with different gradings of severity of the problems, and the ways in which we can help treat them! What are you waiting for? 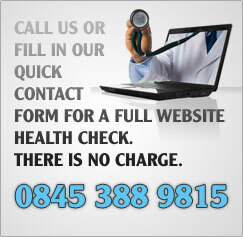 Send an email to doctor@onlywebdesign.co.uk with your website URL along with any problem areas you have with your site. We'll give you an honest opinion of the situation and a competitive quote to solve it.